VIRGINIA BEACH, Va. — In the military, one mistake can get you killed. But in baseball, a .400 hitter who fails six out of every 10 at-bats is exceptional. If a pitcher throws 65 percent of his pitches for strikes, he has good command. Yet he misses his target 35 percent of the time. 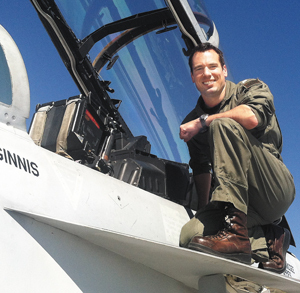 Lt. Matt Manship, a skilled naval aviator who flies F/A-18F Super Hornets for the VFA-213 Blacklions, is a former righthanded pitcher at Stanford during the 2003-2006 seasons. He graduated with a degree in economics and then worked as a financial analyst intern at Maxim Integrated Products for four months before becoming a Project Manager at Cisco Systems for nearly two years. In July of 2008, he embarked on a totally different line of work as he applied to the Navy to attend Officer Candidate School. He ultimately graduated No. 1 in his class and became a combat pilot who has the skill set to land jets on aircraft carriers in total darkness. At top speed, the jets he flies can reach 1,190 mph. He also must be able to maneuver the aircraft in an instant in any direction and be able to press numerous buttons or switches by reaction. If he thinks too much in combat, he could die. In this special interview with Collegiate Baseball, Manship explains the similarities between pitching and being a combat fighter pilot and also gives techniques that may translate well from being a pilot to the pitching mound. He was asked to explain the similarities and differences between being a Naval aviator and pitcher. “The atmosphere is similar with a fighter squadron and in a baseball locker room. Manship said that the No. 1 area that translates well from fighter pilots to pitchers is discipline. “I got a healthy dose of discipline at Stanford in the way the coaching staff prepared players for games. Here is a little taste of what players were required to do. I am not aware of any coach in baseball other than Mark Marquess at Stanford (now retired) who dictates how he wants the players to stand during the National Anthem. He actually mandated that we stay completely still. “This is something that people in the military do as well. They turn, face the flag, and in our case, salute while remaining perfectly still. Manship said once Stanford players were on the playing field, there was no walking allowed. “Coach Marquess called it ‘striding’ which is taking about 10-20 percent off a full sprint. That’s the only way he allowed players to move around the field. “Even when I got to the minor leagues after graduating from Stanford, I was so conditioned with that discipline that I would be running around, and my coaches would have to stop me and ask me to slow down. They would warn me that it is a long season in pro ball, and you must learn to take it easier. “But I always responded that this is how I was conditioned. Manship, who was drafted by the A’s in the 29th round in June of 2006, said that his pitching coach at Stanford, Tom Kunis, was also a strict disciplinarian. Manship said that establishing a routine is crucial in being a pitcher or combat pilot. To read more of the story on Matt Manship, purchase the March 7, 2014 edition of Collegiate Baseball or subscribe by CLICKING HERE.